Webber International University received a B-. Washington Monthly's ranking of 305 out of 346 of Baccalaureate Colleges - Overall Rank was a major contributor to this grade. Webber International University is college with 667 students located in Babson Park, FL. What are the top 3 reasons someone should attend Webber International University? What is a typical Webber International University student like? Describe the type of person that should attend Webber International University. The type of person that should attend Webber international would most likely have to be business oriented. The school is filled with international students, athletes, and smart kids. On April 6, 1927, Grace Knight and Roger W. Babson founded the University which was to carry the last name of their granddaughter, Camilla Grace Webber. Roger Babson was best known for his contributions in the areas of economics and finance, which included the establishments of Babson's Reports and authorship of a number of business publications and books. Among his numerous philanthropic contributions were the establishment of several institutions of higher learning and service on a number of corporate boards, as well as the endowment of several charitable foundations. Webber was originally established as a women's college, with the exclusive purpose of teaching women about business. It was the first school chartered under the educational and charitable laws of the State of Florida as a non-profit organization. The first terms on the Babson Park campus began the following January in the building now known as Old Main, while fall classes were held in Boston at the Hotel Lennox. Students attended classes in this manner until 1940 when Babson Park became the University's permanent campus. In the 1950s, the present lakeside campus was completed with the dedication of the Grace Knight Babson memorial Student Center and Dormitory, followed by the McConnell classroom building and the Michael Parkhurst Webber Auditorium/Gymnasium. Webber became accredited by the commissions on Colleges of the Southern Association of colleges and Schools (SACS) in 1969. In September 1971, the first male students were admitted to the College. Further growth of the campus occurred during the 1970s with the addition of Camilla Dormitory and the George W Jenkins Recreational Area. The dedications of the library complex marked the celebration of the college's 50th anniversary in 1978. During the 1980s the Sabbagh Athletic Center was added to provide excellent facilities for volleyball and basketball. The 1990s have seen the development of an adult program for students over 25 with two years of previous University experience. Students services have been enhances by the completion of the Doc Dockery Student union which houses Mr. O's Snack Bar, a chapel, game rooms, as well as The Cubbyhole, the University bookstore. Intercollegiate athletics have been expanded in the 1990s. Webber is a member of NAIA and the Florida Sun Conference. Webber women participate on the intercollegiate level in the soccer, volleyball, tennis, fast-pitch softball, cross-country, golf, track and field while Webber men compete in cross-country, soccer, basketball, tennis, baseball, golf, track and field and football. 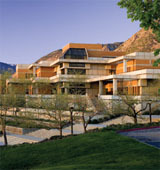 In 2002, the Rex R. Yentes Conference Center was opened. The new building houses a computer classroom, computer workroom, the Career Services Center, Admissions Offices and a 325- seat auditorium. in addition in the Fall of 2001, the University opened a new fitness center with an athletic training facility and newly renovated athletic facilities. In 2002, Webber added intercollegiate football to its athletic program. The Webber Warrior football team competed in its first full season in 2003. The football locker room and an additional fitness center was completed in the Summer of 2003 along with a practice field a short distance from the main campus. Also in the Summer of 2003, a 500 seat stadium and complete lighting was added to the baseball field. In the Fall of 2003 a Computer Information Systems major was added to the academic offerings. With the addition of the new major, a computer mini-lab was opened in the Summer of 2004. Webber will continue to propagate the ideals envisioned by its founders, built upon a solid legacy of experience and knowledge, Webber will prepare tomorrow's business leaders to meet the challenges of the future by instilling a desire of innovative thought and creative accomplishment. What are the top 3 things that students do for fun at Webber International University? Campus housing is available for undergraduates. Housing deposit : $205.00. Housing deposit due : Aug 28. Housing deposit is refundable in full if student does not enroll.. Freshman allowed to have car. No pets. The average student pays $21,375 for tuition, fees, and other expenses, after grants and scholarships. Total stated tuition is $21,050, in-state and on-campus, before financial aid. Learn more about financial aid at http://www.webber.edu/financial_aid/. Estimate the net price for you at http://npc.collegeboard.org/student/app/webber. Webber International University participates in the NAIA Division II for college athletics. Want more info about Webber International University? Get free advice from education experts and Noodle community members.